From time to time, I like to share a few of my favorite photos with random observations, travel tips, and anecdotes. This batch of “postcards” is from my early-October visit to Athens, where I was working on the upcoming fifth edition of our Rick Steves Greece guidebook. Athens is on the upswing. On my first visit, in 2005, the Greek capital felt a little haggard — as if still recovering from their Olympics hangover. Soon after, the Greek economy collapsed, and Athens saw protests, high unemployment, and worries about the future. But on my latest trip, I got the sense that the city is rebounding. I had trouble finding a hotel room — even several months ahead — and discovered a reassuring economic vitality, at least in the central touristy areas. Of course, many Greeks are still struggling. But at least things are on a promising trajectory. 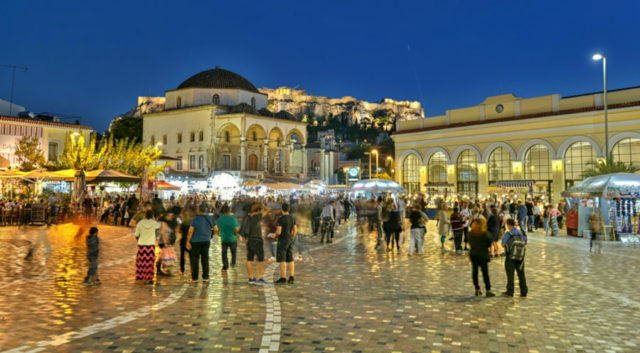 Athens’ central square — Monastiraki — exerts a strange magnetism, day and night. It’s both historic and lovably scruffy, with an old Ottoman mosque-turned museum, a historic subway station, and the Acropolis hovering in the distance. Ringing the square are tacky souvenir stands, rooftop bars with gobsmacking Acropolis views, and designer frozen yogurt shops. I don’t feel like I’ve been to Athens until I’ve enjoyed one of my favorite street foods anywhere. Just off Monastiraki square is a bustling lane I think of as “Souvlaki Row,” where three industrial-strength restaurants churn out cheap plates of souvlaki, gyro, and kebabs (pictured here) — slathered with tzatziki, piled with pungent onions, dripping with grilled tomatoes, sprinkled with chili powder, and wrapped in a pita. I’m not saying this is the best place in town to try souvlaki (that’s a heated debate I am totally unqualified to participate in — though I hear good things about Kosta, just a short walk from here). But it’s one of those Athenian experiences I look forward to, and always savor. 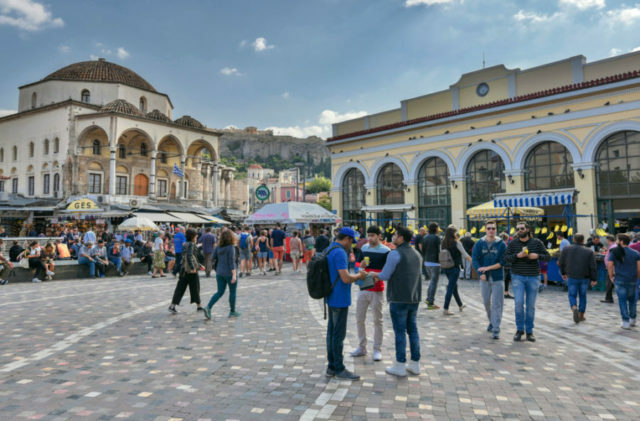 The lively Psyrri district — just across the street from the central Monastiraki square — has completed its transformation from sketchy slum to trendy hotspot. 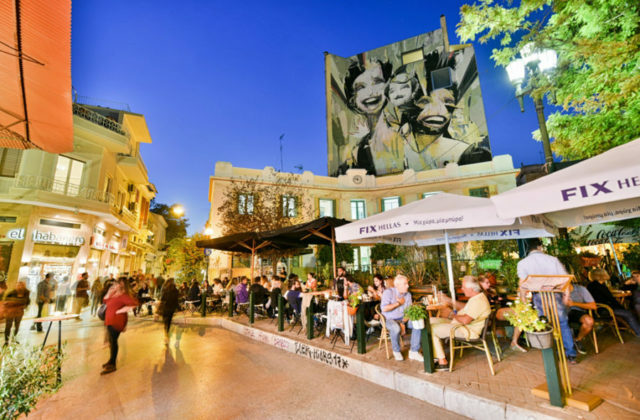 With the 2004 Olympics, Athens rezoned Psyrri to encourage restaurants and bars to open up here, in a bid to spur gentrification. And it worked. 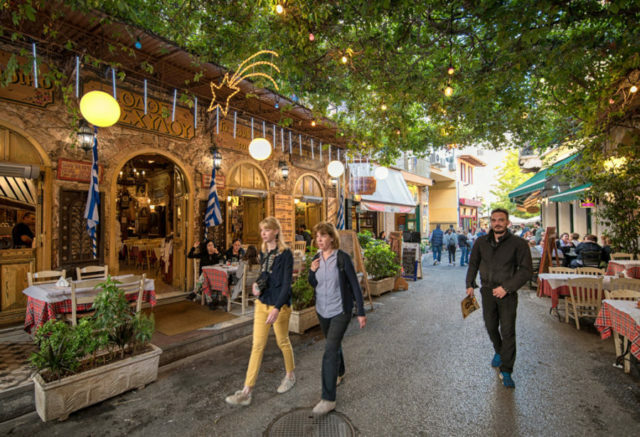 Today this is one of the most pleasant places in Athens to hang out, with a mix of avant-garde bars and accessible, touristy, traditional Greek restaurants. Street art is an Athenian forté. 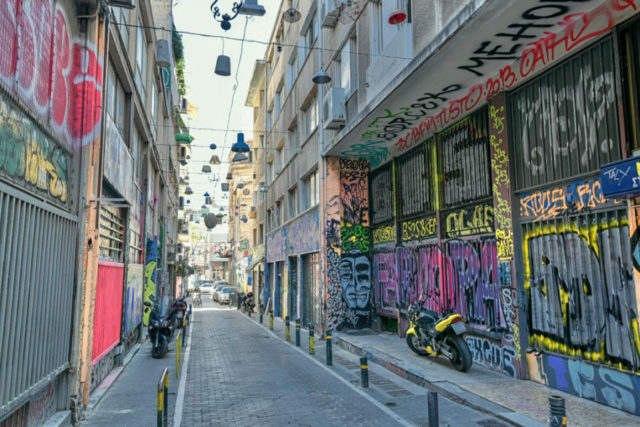 In a city and a country with limited resources for urban beautification, many Athenians consider graffiti an affordable way to make their drab cityscape more colorful and vital. This can be off-putting to some American visitors, who see graffiti as disrespectful. But Athenian street artists are heralded both within Greece and abroad for their talents. 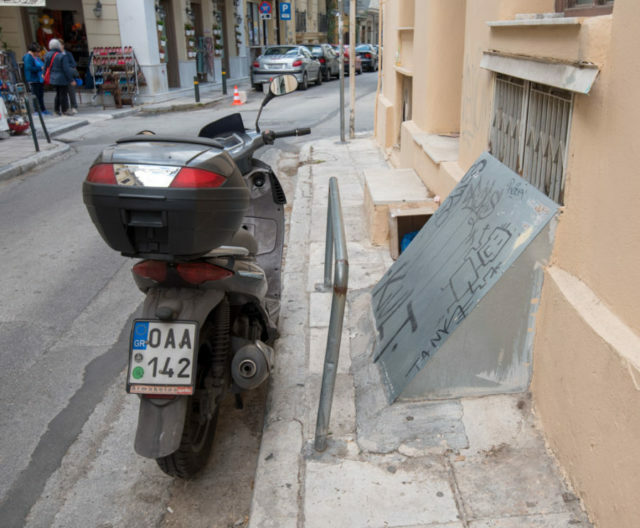 Yes, tagging can be unsightly…but imagine this Psyrri street with nothing but cracked concrete and rusty metal. Through Alternative Athens, I took a fascinating food tour through Psyrri and the adjoining Central Market area. I’ve wandered through the market before, but having a guide explain some of the nuances of the place made it so much more meaningful and accessible. 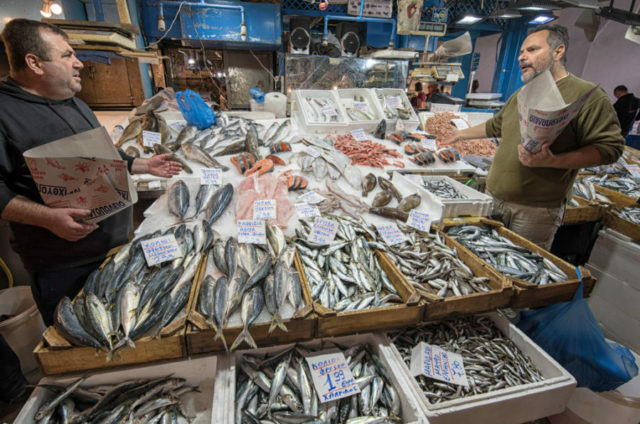 We learned why much of the fish you buy in Athens is frozen (and how you can tell the difference), why legumes are a staple of Greek cooking, and why camel pastrami has a strange popularity among some Athenians. 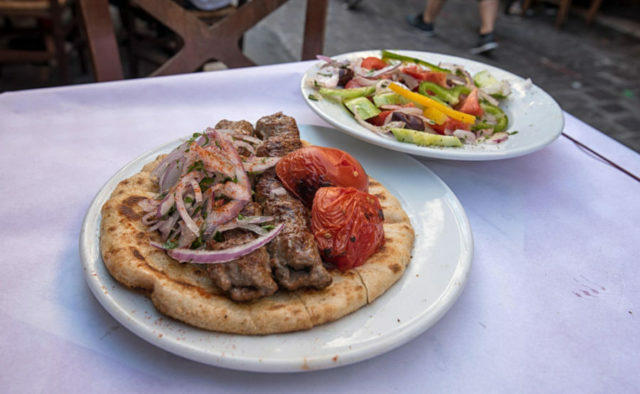 This visit inspired me to write a new food-themed self-guided walking tour of Psyrri and the Central Market for the next edition of our guidebook. As a photographer, I enjoy finding new perspectives on iconic subjects. This was taken at the Acropolis, looking up from inside the Propylaea — the ceremonial entryway to that hilltop ensemble of temples. The Propylaea is a tourist bottleneck, perennially jammed with a slow-moving chain gang of shuffling visitors, most of whom are staring at their feet, trying not to trip over each other. But when you get under those beams, squeeze over to one side and gape up in awe, at what — at the time — was the grandest gate ever built, still standing some 2,400 years later. I enjoy simply getting lost in Athens’ urban jungle and stumbling upon sleepy squares surrounding stately churches. This no-name church — a 10-minute walk from the main tourist zone — is both beautiful and typical, with a little religious-goods sales kiosk out front where you can buy a cheap icon. Athens is the Acropolis, delicious souvlaki, and the most beautiful statues from antiquity. But it’s also urban blight. This photo — taken in the touristy Plaka neighborhood — is quintessential Athens: a sidewalk blocked in three different ways. The photo below shows the exquisite 100 B.C. 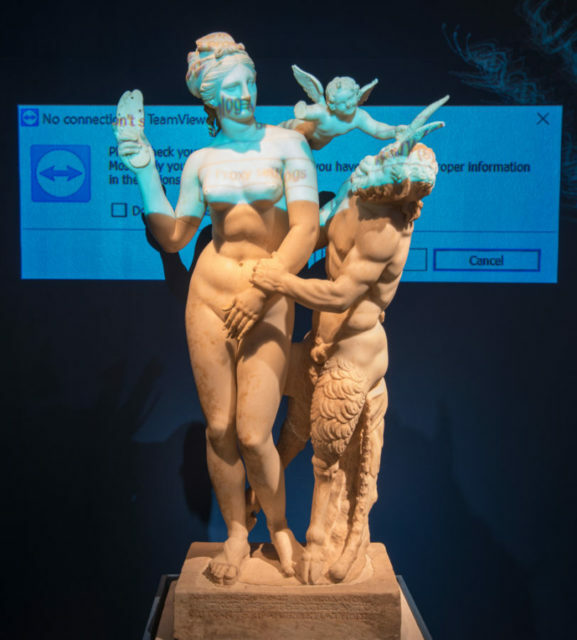 statue of Aphrodite and Pan at the National Archaeological Museum, all dolled up for a high-tech temporary exhibit…which is currently on the fritz. Some people are put off by Athens’ scruffiness, but over several visits, I’ve come to find it endearing. If you need everything slick, sanitized, polished, trouble-free, and injury-proof, Athens is not the city for you. But if you can approach the rough edges with a sense of humor, Athens is richly rewarding. At the end of the day, Athens is one of those cities you accept on its own terms. With each visit, I enjoy it more and more. And I can’t wait to see what comes next. The funky Psyrri district was included in my list of 10 European Discoveries for 2018. 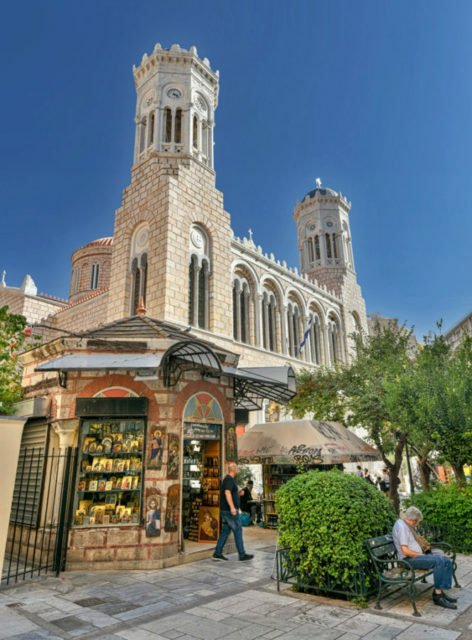 All of our best Athens tips appear in our Rick Steves Greece guidebook. 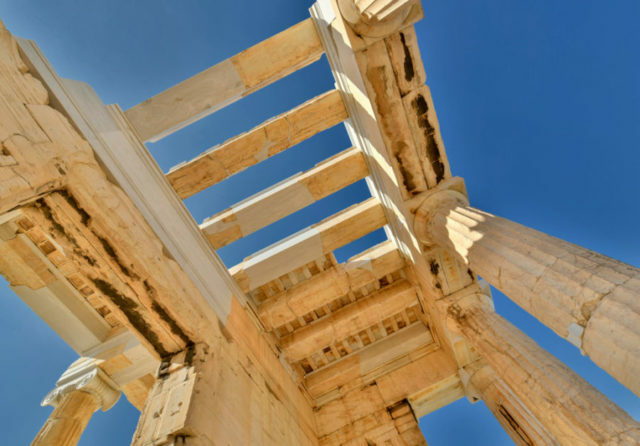 And if you’re headed to Athens, be sure to use our free audio tours of the main sights. 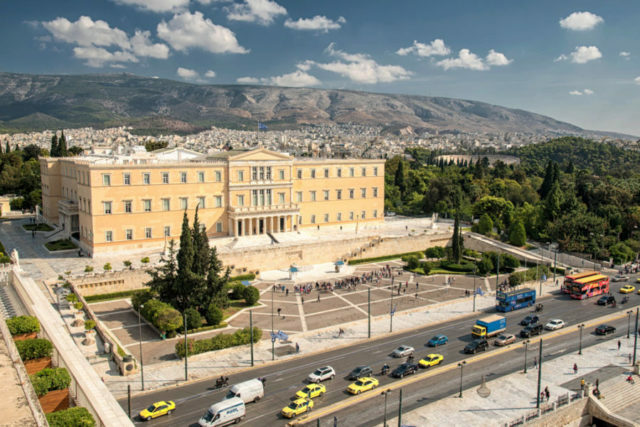 Our Athens and the Heart of Greece 14-day tour begins and ends in Athens. Hi Scott. Hm…that’s cutting it close. The new Greece book is due on June 19. Keep in mind you can also buy our books on Amazon Kindle, so even if you’re already in Europe when it comes out, you can still get it. Happy travels! Great article! I was in Athens last Fall and, as a fan of antiquity, I really enjoyed it. I like to think of Athens like Berlin used to be before the Wall fell and gentrification got underway. It’s definitely a little rough around the edges, but I always felt safe and thought the subway system was pretty modern and easy to use. Be sure to see the Acropolis late in the day as the sun sets and the Greek soldiers arrive in formation. We loved the Psyrri area. Our hotel was just off this street in your postcard. We loved our week in Athens. Loved Athens several years ago, spent four days. Crowds are manageable in the off-season, and hitting attractions when they open often gives use unobstructed views. The Agora has my heart. It’s like a park, with ruines not blighted by reconstruction and cranes. I think many people miss it on their way in or out of the Acropolis. The National Museum was awesome, I have a picture of that statue. Again, I went early, and had the place to myself. Do bring the kids to the top of Lycabettus via funicular and walk down, preferably at sunset. Maybe a cooking class…fun for all. We spend at least a week in Athens every year and took along teenage grandkids last year. Also, staying in rented Apts is amazing. We had a 3 bedrooms, close to the Acropolis, in Koukaki. Interesting article and the photos were beautiful. Nice pics, but if you want to see more of Athens please visit Exarchia. I know, its not everyone cup of tea, but the place is full of lovely restaurants and upcoming shops. When we are in Athens we always stay there. Visited last December and February.